1410-16 Shettleston Road, Shettleston, Glasgow. G32 9Al. Tel: 01417782368. Shettleston pubs have not changed much since the beginning of the 1900s, some of them date back even further. The Railway Tavern is one of the districts earliest, there has been an Inn on this site since 1806. Change Keeper (Inn Keeper) James Mitchell ran a small business here in 1806 and sold it to William Pender in 1811. In the feu records William Pender bought 60 falls of ground in the middle quarter of Shettleston where the inn once stood. In the middle of the 1800s John Leckie a well known spirit dealer in the area took over the inn with the help of his wife. The Leckie family lived not far from their business in Springboig House. When John died his wife took control of the business until around 1870. There was no record of the inn for about four years maybe this is when it was demolished and a new building erected on the site. Malcolm Martin and wife Rachel then became the new owners, the premises was then a public house. The Martin family also ran a thriving licensed grocers business in Sandyhills. Rachel ran the pub and the grocers shop when her husband Malcolm died. Over the years the licence was transferred to many well known publicans in Shettleston until 1905 when James Neilson took over the running of the pub. The Neilson family were also known in the area as they ran licensed premises in the Fullerton area of Tollcross for many years beforehand. James Neilson was married to Charlotte Mair, her family were also well known publicans in Shettleston, they owned the Old Drum. 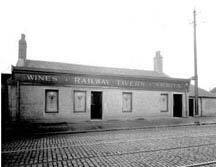 The Railway Tavern stayed in the Neilson family for almost 100 years, they also owned one of the most hidden pubs in the east end of the city The Bushes, situated in Easterhill Street. The old etched art nouveau windows of the Railway Tavern are long gone but the interior has survived, the central gantry and island counter is still there with the little snugs. The pub was sold in 1993 to Mr Greenhorn, charge hand Gerry Lavelle is a real gentleman who has worked in the pub for thirty years. This is an old mans pub with great character, if you like good patter this old east end boozer is a must. The Railway Tavern, August 2005. 1806 James Mitchell to William Pender. 1822 William Pender to Hugh Fraser. 1838 Hugh Fraser to Robert Fleming & David Ferguson. 1842 David Ferguson to Thomas Kennedy. 1846 Robert Fleming & Thomas Kennedy to Robert Law. 1881 Robert Blyth to Malcolm Martin & Mrs Rachel Watson. 1895 Mrs Rachel Watson to William Pender. 1895 William Wyper to John Somerville as trustee. 1897 John Somerville with concent of William Wyper to Patrick Higney. 1897 Patrick Higney to Archibald Arrol & Sons Ltd.
1905 Archibald Arrol & Sons Ltd to Patrick Higney. 1905 Patrick Higney to James Neilson.